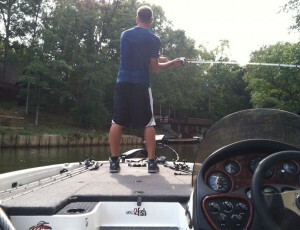 The bass fishing team was created three years ago by four friends at Illinois State. If you have ever seen a boat at Festival ISU, chances are the bass fishing team was behind it. The student organization was created three years ago by four friends at Illinois State who knew of other colleges around the country with fishing teams. Even though most of the original members have graduated, the team’s roster is at an all-time high with more than 30 members. Team President Bryce Wegman said fall is slower for the team, with few local tournaments. But things pick up during the spring, with competitions almost every weekend through the Midwest Collegiate Series, in which Illinois State competes against other schools in nearby states. These challenges lead up to the national championships in the spring, which are televised. “It gets ISU’s name out there, and we even have sponsors,” said Wegman, sophomore construction management major. This is Alli Skül’s third year on the team, and her second as team secretary. The senior health education major originally joined because she loved to fish, and is now one of a few women on the team. “It started out like, ‘I have to prove myself to them,’ but now that I have gotten to know the guys, it’s awesome,” she said. Like Wegman, Skül had fished for years before joining the team, but only recreationally. “I had never been in a tournament. It was a new experience going with other people besides my dad to see how they approach different techniques,” she added. One of the few founding members still around is team Vice President Anthony Cancelli, a senior business management major. When he and his three friends started the team, they had to jump through a lot of hoops to make it an official registered student organization (RSO). Then they had to get the word out. “Festival ISU is big for us. So is Facebook, since we have a page,” Cancelli said. When the team first began, they were in need of an adviser, since all RSOs require one. Luckily, Illinois State’s executive director of facilities management, Chuck Scott, stumbled upon the team two years ago at Festival ISU where he spoke with Skül. With each year, the team grows, both in size and skill. According to Cancelli, more than 100 people initially signed up at Festival ISU in August 2013. Although not that many people decided to stick with it, he believes that membership will continue to increase. “We also have freshmen who can be leaders in a few years. We have a really good foundation,” Wegman said. With that increased membership, leaders still have to target whom they reach out to when promoting the team. One consideration is the need for boats, since not everyone has one. For Skül, her skill improvement is what is most beneficial. “I love being able to get feedback. Everyone comes from such diverse backgrounds, so it’s interesting getting different tips. I’ve learned a lot,” she said. Wegman and Cancelli agreed that the team is a good experience, with something to offer everyone, whether they are tips for more recreational fishers or more practice for those who want to continue fishing post-graduation, like Cancelli. One former teammate even went on to start his own lure company, Wegman added. But despite those challenges, the team’s leaders are passionate about their sport. “We get to represent our school doing what we love to do,” Wegman said. Grace Johnson can be reached at gvjohns@IllinoisState.edu.